Former Cuban president Fidel Castro publicly criticized President Barack Obama’s recent Cuban trip in a letter published Monday, his first official response to Obama’s historic visit. “We do not need the empire to give us anything,” Castro said in a 1,500-word column for Granma, the Cuban Communist Party’s official newspaper. “My modest suggestion is that he gives it thought and does not attempt now to elaborate theories on Cuban policy,” Castro wrote, citing what he said was a part of a U.S. history of aggression toward Cuba, including the 1961 Bay of Pigs invasion and nearly 60-year blockade against the communist country. 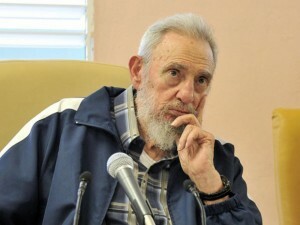 Castro was not absolute in his criticism of the president. He praised Obama’s “humble origin and natural intelligence,” which were “evident” during the trip. Obama did not meet with the 89-year-old former Cuban leader during his three-day visit to the island nation. Castro’s brother, President Raúl Castro, attended a baseball game with Obama.